How We Lost the Plot Christianity gone bad. The history of Christianity contains a surprising and disastrous plot twist that has taken Christians off the rails for hundreds of years. This hijacking of the faith has had horrible repercussions over the centuries, and has led to hundreds of thousands of deaths at the hands of Christians. This plot twist was not unintentional; the enemy knew he had to disarm the Church of it’s most powerful weapon. Let’s take a look at what this twist was and how we got there. Becoming a Christian in the first century meant death. Jews (like Paul) would kill Christians because they believed they were heretics who followed a false messiah. Rome would kill Christians because they were unpatriotic and wouldn’t pledge allegiance to the Empire. Violent death loomed around every corner for the Early Church. The first three hundred years of Christianity were filled with brutal persecution. Rome was a Swiss Army knife of torture towards the Early Church: swords, chains, vicious animals, spears, torches, crucifixion, dismemberment, disembowelment, beheading, and more. Christians were put into arenas with gladiators and lions, who shed blood for an audience that craved violence. Yet despite all this persecution, the Early Church did not fight back. They didn’t raise a sword or organize an uprising; instead they offered love, service, food, water, and prayers to their terrorist oppressors. The Early Church was spread all around the Roman Empire and beyond, with very little communication between these pockets of Jesus followers. Being mostly on their own, they often formed their own distinct and varied views on faith issues. One issue in particular— how to respond to the empire’s violent persecution— stood out apart from the rest, because every single group of believers throughout the nations agreed on it. All early church leaders agreed: Christians were NEVER to respond to violence with violence. Christ’s command to “love your enemies” was the most popular verse in the Early Church.1 For the first three hundred years, no other verse was quoted more. Loving one’s enemies set Christianity apart from every other faith that had ever existed. Jesus makes it clear here, that in order to be “children of God”, you must love your enemies. The Early Church recognized that it was their mission to imitate Jesus in all things. Jesus refused to use violence— even when his, or other lives, were at stake. Having love for others, including enemies, was the chief mandate. Jesus even explains when arrested that his disciples are not fighting in his self defense as proof that his Kingdom is unlike kingdoms of the world. “Turning the other cheek” wasn’t just a nice thought, it was a way of life for the Early Church. Refusing to participate in violence was a unanimous position among the Early Church. Christians were to never, under any circumstances, kill another person: not in self-defense; not as capital punishment; not in war— never! The subject of killing was prohibited every time the early church writers mentioned it. Even when the issue of military service and warfare was discussed, Christians were prohibited from participating.2 Nowhere in written record in the first three hundred years of Christianity, is killing ever justified— not even for soldiers. There was not a single Christian writer in the first three hundred years of the Church that said Christians should serve in the military. Some writers even completely forbid Christians from entering into the military.3 The church, without exception, did not allow those already in the military to be baptized. The same applied for those who worked in government, which was also banned. One early church theologian, Tertullian, wrote about how a believer could not be a solider: “The Lord, by taking away Peter’s sword” (referring to the incident in Gethsemane) “disarmed every soldier thereafter.” In the very next statement he says: “We are not allowed to wear any uniform that symbolizes a sinful act.” That “act”, refers to carrying a sword that Jesus took away. Other writers stated that Christians cannot participate in war, “even if they are ‘just’ wars.”4 The church agreed: Military service was wrong because killing is wrong. For though we live in the world, we do not wage war as the world does. The weapons we fight with are not the weapons of the world. Early Christian leaders for the first three centuries disagreed on a whole lot of topics. One topic none of them disagreed upon, was that non-violence was absolutely central to Christian living. Then, 280 years after the death and resurrection of Jesus, in AD 313, everything changed. For a dozen or so generations, Jesus followers considered themselves foreigners in the Empire, recognizing they were citizens of the Kingdom of God alone. They were a persecuted minority who never sought to have “power over” others. The word “martyr” which originally meant “witness,” came from this time period. A sword would never be held in their hands, instead it would be held at their necks. 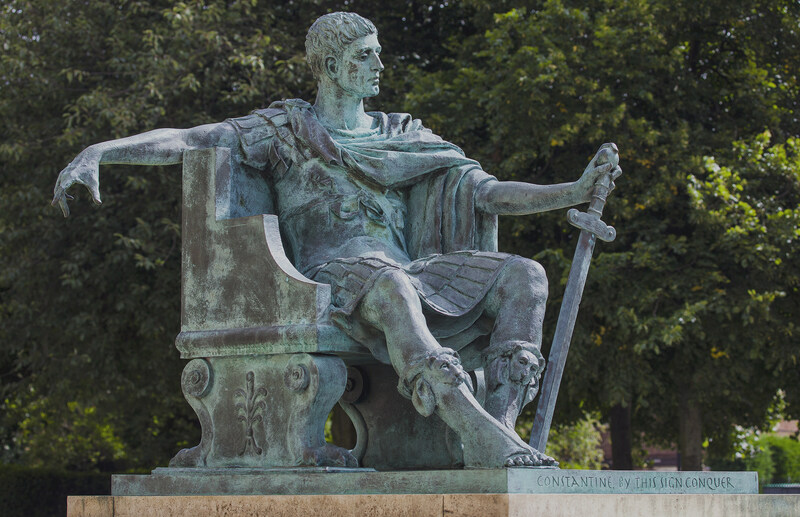 In the year AD 313, the emperor of Rome, Constantine, had a vision just prior to an important battle. A voice told him to paint “Chi and Rho” (☧, the first two letters of “Christ” in Greek) on the shields of his soldiers. The voice told him, “By this sign you shall conquer.” Constantine listened to the voice in his vision and he won the battle. At this, the Emperor “converted” to Christianity. This would be the first time in history that Christianity was ever associated with violence. Everything changed overnight. Emperor Constantine ended the persecution of Jesus followers. Christianity was legalized. Within seventy years it was proclaimed the official religion of the Empire. It was now considered a crime not to be a Christian. Shortly after, the first recorded instance of Christians killing other people occurred. The Kingdom and the Empire became fused, and thus, the age of Christendom had begun. One of the most certain results of historical scholarship is that Jesus and the early Christian movement of the first three centuries practiced non-violence and forbade participating in the military. Examination of early church writings indicates universal condemnation the voluntary enlistment of Christians in the Roman army, which also, interestingly, served as a domestic police force for the empire. Augustine, a fourth century theologian, sought to justify violence and killing by the Christian. By this point in the history of the empire, Rome had suffered repeated assaults by the barbarians. A fair number of pagan Roman authors were blaming the rise of Christianity for the sorry state of Roman defenses, because a state religion that, in its sacred texts, appears to reject violence in favor of a command to love would necessarily undermine the empire’s patriotism as well as its capacity to defend itself against invaders. Thus Augustine followed the lead of his teacher, St. Ambrose, and utilized sources from the pagan philosophers such as Cicero as well as the Old Testament to formulate his argument against non-violence and non-participation in warfare. Thus the “Just War Theory” was born. The basic structure asserted that: 1. The act of killing is, in itself, not evil, since all persons eventually will die anyway. 2. What is determinative of the moral status of war lies not in its outward aspects but within the interior disposition of those who wage it. 3. Since the temporal order and civil authority are ordained by God and controlled by him [derived from Augustine’s understanding of Romans 13], we are required to obey rightful authority: to obey rightful authority is, ultimately, to show obedience to God himself. In the most wicked reversal, the cross became the Christian symbol of killing for Christ, rather than dying for him and the gospel. The Empire lavished the Church with riches, resources, status, and power. In return, the Church lavished the Empire with the theology to support its violent rule, by ignoring the teachings of Jesus. Christian theology shifted from being “Christocentric” to “Bibliocentric” in order to support theocracy, wars, riches, mandatory tithing, and the divine right of kings. During the Reformation in the sixteenth and seventeenth centuries, almost every Christian denomination fought each other, killing Catholics and Anabaptists by the hundreds. Reformers used the Bible as a flat revelation, and talked about “the authority of Scripture” more than “the authority of Jesus.” This misuse of Scripture allowed Protestant nations to fight wars against Catholic nations, all in the name of God. Christians coming to the long-inhabited land of America, participated in the slaughter of millions of Native Americans, as well as the enslavement and murder of millions of Africans, as a means of conquering and establishing this new land for Jesus. During World War II, most Nazis being Christians, wore belt buckles which said, “God is with us.” While today the Church no longer holds the power of Empire, this mindset is still very much alive today. When Jerry Falwell on CNN, reflecting a widespread sentiment among conservative Christians, says America should hunt terrorists down and “blow them all away in the name of the Lord”, he is expressing the same mindset embraced by Constantine and Empire. When Christians try to enforce their “Biblical values” on select groups of sinners by power of law, they are essentially doing the same thing, even if the violent means of enforcing their values is no longer available to them individually. History has shown that the most harm has come to the Kingdom of God from its fusion with Empire, and its violent ways. Not only has the Church tortured and killed as the world does, it did this under the banner of Jesus Christ. We were told to serve others, but instead we lorded over them. We were told to turn the other cheek, but instead we cut off their heads. We were told to love our enemies, but instead we burned them alive. We were told to bless those who persecute us, but instead we became ruthless persecutors. We were told to take up our cross, but instead we took up the sword and nailed them to it. This tragic history has to be considered one of Satan’s greatest victories. Thankfully, not all Christians throughout church history have been co-oped by Empire. There have always been groups, sects, and denominations that have stayed true to the non-violent teachings of Jesus. The Anabaptists continue with their long-held tradition of resisting the demonic allure of violence, even to the point of persecution and death at the hands of other Christians. Just as the original Reformation was brought about by the invention of the printing press, the invention of the internet is bringing a New Reformation: a re-focus on the teachings of Jesus as the center of the Christian faith. Christ followers can celebrate the death of Christendom because it is only through the non-violent way of Jesus, that the Kingdom of God will grow! Didache 1.2; Second Clement 13; Justin Martyr, First Apology 14– 16, Trypho 85, 96; Irenaeus, Against Heresies 2.32, 3.18, 4.13; Athenagoras, Plea 1, 11; Clement of Alexandria, Educator 3.12, Exhortation 10, Miscellanies 4.8; Tertullian, Apology 31, 37, Spectacles 16, Patience 6, 8, Marcion 4.16, Scapula 1; Origen, Celsus 7.58– 61, 8.35, Commentary on John; Cyprian, Jews 3.49, Patience 16; Lactantius, Divine Institutes 5.10. Origen, Against Celsum; Cyprian, Mort. 2; Ireneus Adv. Hers. 5.24; Adamantius, Dialogue on the True Faith 1.10.